Adding an old fashioned thrill to the game: a few words about sealing a move. It has been so long since the last top event featured an adjournment that many of us actually forgot how it all works - and quite a few of the younger were never even bothered to study their chess history... So, let's freshen up our minds and go through it all again! When can a game be adjourned and who can adjourn? Read more about Adding an old fashioned thrill to the game: a few words about sealing a move. 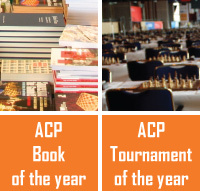 The ACP, in collaboration with Science Park Amsterdam Chess, is proud to announce the "ACP Golden Classic" that will take place in Amsterdam from 14 to 22 July, in the same venue and at the same time as the Dutch Championships and the SPA Open. The Women's World Blitz Championship 2012 organized by the ACP and the Georgian Chess Federation in Batumi has come to an end. The championship was dominated by Valentina Gunina from Russia, who scored 13 points in 15 games. The silver medal went to Natalia Zhukova from Ukraine and the bronze to Anna Muzychuk representing Slovenia, both with 10.5. The Women's World Rapid and Blitz Championships are followed by the spectators from all over the World - the official website of the championship has been visited by chess fans from over 130 countries. The Women's World Blitz Championship 2012, organized by the ACP and the Georgian Chess Federation, is taking place in Batumi, Georgia. The prize fund is 41000 USD. After 8 rounds, Valentina Gunina from Russia, the European Blitz Champion 2012, is leading with a perfect score. The Women's World Rapid Championship 2012 organized by the ACP and the Georgian Chess Federation in Batumi has come to an end. It was already the second extremely successful elite tournament for women organized by the ACP and the Georgian Chess Federation in Georgia this year. With only a few days to go before the start of the Women's World Rapid and Blitz Championship organized by the ACP and the Georgian Chess Federation (Batumi, 30 May - 6 June 2012), the ACP is proud to announce to both its members and the chess community yet another step in its effort to improve communications.